This is an evaluation board for the ADXL345 three-axis MEMS accelerometer. The ADXL345 is an awesome little accelerometer, capable of measuring acceleration of up to ±16g at up to 13-bit resolution. The evaluation board includes everything you'll need to adjust the ADXL345's settings, and monitor and log its outputs. The on-board ATmega328 takes care of all the I2C/SPI communication with the ADXL345, and it will also log the x-, y-, and z-axis acceleration values onto a uSD card. The board includes a USB interface, which allows you to read/write any of the ADXL345's registers using a terminal emulator. The default baud rate is 57600bps (8-N-1). The UART pins are also broken out allowing a direct TTL interface with the processor. Power can be supplied by 2xAA batteries, or with a 3.0-3.3VDC power supply at the VCC/GND pins. 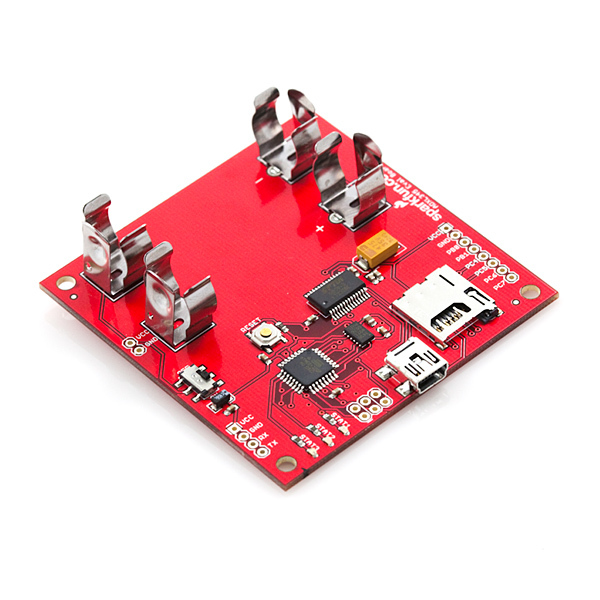 The ADXL345 evaluation board does not include batteries, uSD card or a USB cable, check the related items section below for these products. The source code provided below is written in C and bundled with hex files ready to load, however we've also made an Arduino sketch available that returns values from the ADXL345 so that you can take advantage of the Bootloader. The Arduino sketch doesn't do anything with the on-board LEDs but it does operate the accelerometer. Arduino bootloader "Lilypad Arduino w/ ATmega328"
I recorded a lot of data using this accelerometer.I have around 750,000 data points. I did set the Accelerometer to +/-4G before i started recording. Can anyone tell me "In 1 second, how many data points get recorded" ? That way i can correlate the Acceleration vs Time. Is there a way to communicate with multiple ADXL345 on the same I2C bus? Hello All, I am planning to use this Accelerometer on a device to measure Vibration. The question i have is "Can i put the Accelerometer inside a Ziplock bag ? By any chance, if the batteries heatup, is there a chance that the Ziplock bag can catch fire ? Nope, mostly because plastic bags just melt and don't catch fire. But why would the batteries heat up to the point of melting plastic? The accelerometer and/or SD card won't pull that much power. If you shorted the batteries its possible (so don't short the batteries). In other words when working with electricity you should always be careful, but as long as always a few precautions should prevent problems. Hello All, I used this Accelerometer to capture Vibration Data. For example, in X-Axis the value is fef6, in Y-Axis the value is 22 and in Z-Axis the value is fff6. Now i have converted this data as per "nuFcrapS - The simplest way i found". After converting, how i do i get meaningful Acceleration G values. Can someone please explain this in detail ? Hello, hoping someone can help me out here. I'm trying to set the accelerometer into 3200 Hz, right now I have the BW_RATE register set to 00001111, which according to the datasheet is 3200 Hz. I've tried other frequencies, which have all worked. My baud rate is 57600. Am I missing something? Is it possible the board will not allow 3200 Hz? I am trying to change the firmware so the accelerometer is in the +/-16G range. I am having problems compiling the code into a hex file. How do you create a new project in AVR Studio, import all the code, and then write to hex. I can load the Hex and EEprom to the device no problem with a STK500. I am not that familiar with makefiles, but I did modify a makefile to work with the stk500 programmer, and then used cygwin to try and compile, but I just get lots of errors. Any help? i want to operate 3 of those evaluation board in different locations. Is there a easy way to simultaneously start and stop these? For example with a trigger pulse through a wire? Ok I got it. The Ev. Board came configured with a 10 bits resolution and +-2g acc range. If the acceleration values are in the FFFF range it means it is working on the negative direction (For example in the X axis: FF = - & FF = 255 => -255). So I created a Matlab script that handles this, if the value starts with FF just consider the second two letters and add multiply by -1, if it doesn't start with FF just consider the whole value, then multiply this values by (4)/2^10 to get it in gravity values (g's), where 4 = +-2g and 2^10 is the resolution of the data. Good luck! i bought this evaluation board, and i have a serious problem... after running board, state LEDs turn on and off two times, then 3rd STAT light (yellow light) turned on continuously and does not turn off... SD cards being failed ! and when connect board to computer, commands run and board react normally, but no logging data appeared.... Help me please..... so thanks. I don't know if this is the solution to your problem but I ordered a card and SD chips from here and they didn't record any data. I am running a Mac and I reformated the SD chips using the disk utility and everything worked correctly. It appears the SD chips sold here have some strange formating that doesn't work with the software. I have chips from another source but haven't tried them yet so they are an unknown. at what time does the logger record data, every second? User Guide http://www.sparkfun.com/datasheets/Sensors/Accelerometer/ADXLEvalBoard%20User_Guide2009-09-14.pdf Page 2 "The accelerometer is initialized to log data at 100 Hz with +/- 2g range." I'm having trouble getting the data from my ADXL345 into a meaningful format. Currently, whenever I try to open the output .csv file with excel I get three columns of gibberish like, 'ff0a, 00f5, ffaa, etc.' Any help y'all have would be g r e a t l y appreciated!! Each column is data from one of the three axes and each word is a hexadecimal ascii representation of the acceleration value. To decode this, capture the data into a text file and then read it into Excel. Refer to the post above that starts with "The simplest way I found" and write back if that's not clear enough. What version of AVR studio was used to build ADXL345_Eval_v16.hex? Is all of the code needed to build ADXL345_Eval_v16.hex in the file ADXL345_Eval_v16.zip (or included with AVR Studio)? the response is always the same: resp=0x90 what should it be? dear all, I have a lot of problem with this demo board: - serial connection won't work properly: seems that the board TX data at 57600, 7,N,1 but it accept command at 8,N,1! So command "R 00" return "Invalid Command" - if I reply in 8N1, it responds, but it's almost unreadable: "Reg. AddÃ²Ã¥Ã³Â³ÂºÂ ÂÂÂÅ Â¢ÂµÂ·Å¾ÂÂ®Â±Â´Â½Â±Å¾ÂÂ±â¢â¦âÅ¾" the board seems to be BROKEN !!!! So I decided to upload the HEX file. but upload won't work, too: it stops each time in different position. SEEMS ARDUINO BOOTLOADER NOT PRESENT! But I am new with arduino. Should it be? I would like to actually use this as a 3-axis accelerometer data logger. Obviously it won't do this out of the box. Any suggestions? From the description "The evaluation board includes everything you'll need to adjust the ADXL345's settings, and monitor and log its outputs. The on-board ATmega328 ... will also log the x-, y-, and z-axis acceleration values onto a uSD card." What is it you're missing? Open the unzipped source code and look for a file called ADXL345_Eval_v16.hex. Locate the location where you unzipped the Arduino software and open the "hardware" folder. Then open the "tools" folder. Then open the "avr" folder. Then open the "bin" folder. That's it... Now you should be back to the factory image and able to record accel values to the sd card. I have my board spewing data through CoolTerm on my Mac. Read the UserMan... I can stop the data stream by pressing any button, as the doc explains, but I cannot restart the stream by pressing 's' (as the doc explains). I also can't execute read and write commands. I type a command in, and I get a carriage return in the terminal, but nothing happens. I'm running the correct comm's setup and have FTDI drivers installed. Has anyone else encountered this problem? Thx. OK, I figured it out. I added a 3ms Transmit delay and made sure Terminal Key Emulation was CR only (not CR+LF, not LF). Now it works through the terminal emulator as described in UserMan (aka doc). For those wanting some Arduino code for this board based on the breakout board tutorial, check out this. The eval board is an Arduino! :-) It runs the Arduino bootloader and has an onboard USB-Serial connection implemented using an FTDI chip. In addition, it has the accelerometer and all associated circuitry mounted on the board, along with AA battery contacts and a micro SD card slot. All you have to do is make sure you have the Arduino IDE installed and then plug in the board via USB to your computer. You should then see a new serial port available to upload to in the IDE. Select "Arduino Duemilanove w/ATmega 328" as the target board, paste the code from my pastebin into a new sketch and hit upload. Voila! If you now open a serial monitor window set to 9600 baud using the same serial port you just uploaded to, you should see acceleration values being reported back. I buy the Evaluation Board recently, and i can change the ODR by burning BW_rate of register.I have a trouble that the ODR couldn't modify over 200Hz, but i need use it to measure mechanical vibration for 3200Hz. Do you have any idea to change the ODR for 3200Hz? Hello. I don't know where I could ask this question. I am investigating ADXL346 as I really like the orientation functionality. However, the interface level is 2.75 volt max. Does anyone know why they would design something like that? I have never seen any MCU works at that voltage. My chip works at 3.3V and that makes it really hard to interface. Lower voltage equals lower power consumption, so VCCs are headed in that direction (many Atmel chips work down to 1.8V). You can use voltage translation circuitry to interface anything to anything else, but given the extra hardware, it might be easier to just change the orientation in software. But how do you use the data>??? OK, it logs to an uSD and there is tons of available data in 2's compl. form. I need to draw a graph of that... and changing each value at a time is not an option. Any suggestion on how to create the graphs for each axis? The simplest way I found was to use a spreadsheet program like Excel and use the built-in function hex2dec(). You may need to follow that up with an if() to do the two's complement adjustment, as my Excel didn't seem to recognize negatives. When plotting, you may also want to calculate the absolute magnitude of the three channels by squaring the signed decimal value of each channel using =power(), summing all the squared values and then taking the square root using =sqrt(). Thanks...this is a very helpful post, which explains how to quickly interpret the data, and is not found in any of the docs. Had a plot in 10min. 1. Beware of the Pocket Programmer and its 'Power Target' switch which will apply 5V to the board. While the '328 doesn't mind, the ADXL345 has an absolute maximum rating of 3.9V. I feel lucky. 2. Beware of the labels on the header socket JP1 - the signals labelled 'PC6' and 'PC7' go to ADC6 and ADC7 on the 328P and not to PORTC. Although there is a PC6, it does not come out on the header (you can't use it anyway because it's shared with !RESET) and there's no such thing as PC7. I added I2C support by tapping into the traces off the mcu and running two jumper wires over to the .1" port output. Just make sure PORTC bits 1:2 are set to input mode! I have finally started communicating with my board. But, my data coming out many times is in the 65,000 range. I can have 2 axes working fine, and the 3rd is saturated (like FFF4 and other nonsensical numbers). Any thoughts? Am I reducing the data wrong? Does anyone know the clock speed of the atmega328p on this board? I can't seem to find it in the documentation. i believe the STK500V1 boot loader is set for 8mhz clock. So, it should be 8mhz. The output is the raw 10-bit data from the accelerometer. You'll want to check out the datasheet for the ADXL345 (follow the link to the related product). You'll find out that the raw data is output as a 2's compliment number; basically a number that can represent positive and negative numbers. Depending on the range you've selected for the ADXL345, you'll have to scale this number appropriately to come up with the number of g's. I jsut plugged mine in and looked at the data. It looks like a combo of hex and decimal output. Any thoughts? I just pulled my board out and it has no reset button as advertised. Any help? Please note that the above avrdude cmdline does the programming over the USB connector, not the ISP connector with an external programmer. 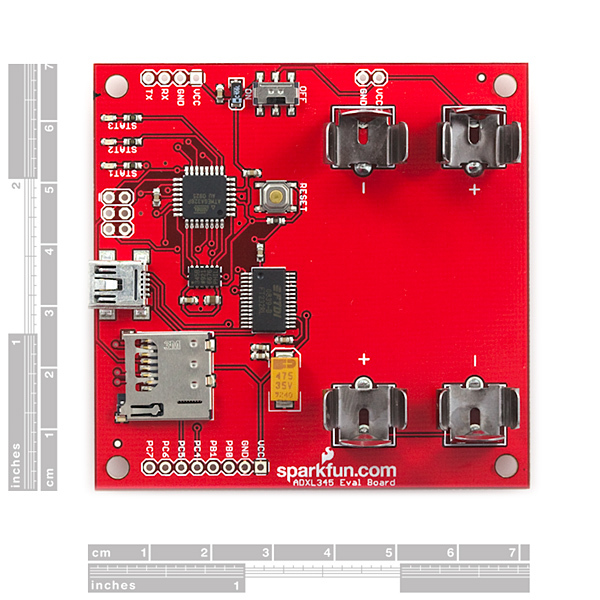 Anyone coded in Arduino for this board? I appreciate if you can share. I for one am glad it's not programmed in arduino. 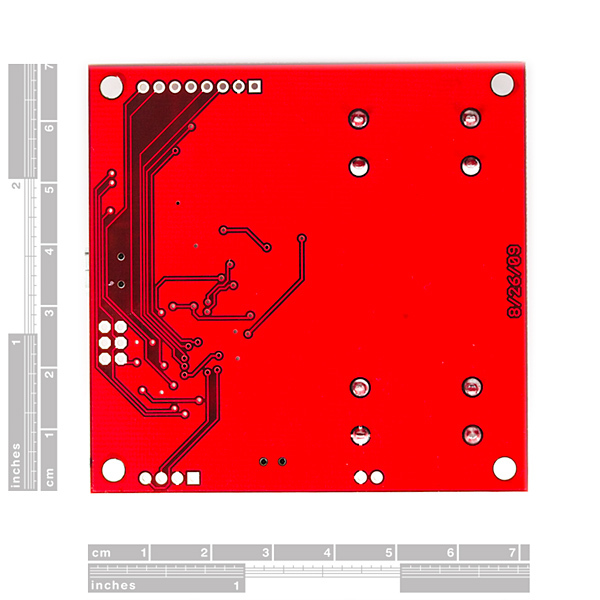 Can you please provide an arduino template for this board? As it is now I can program the board with arduino but I am having troubles accessing the accelerometer and the sd card. Can you give a brief description on how to use the pocket avr programmer to upload a script on the board. The board doesnot say which end is the first pin of the 6 pin header, can you put some light on it. If possible can you give the command line to be written for avrdude to write the source code (the one provided on this page) to the board. I tried a number of things but it keeps saying initialization failed. KD, please see my separate comment that answers your questions. I didn't see a low-pass, anti-aliasing filter on the schematic or a place on the board to put one in. Did I miss it or is it built in, somehow, to the accelerometer? The ADXL345 is a digital accelerometer that does not have the option of adding any analog filtering for anti-aliasing. You could add your own digital filtering, the application note AN-1025 describes using the FIFO Buffer to reduce the u-controller poling rate while maintaining the advantages of having a higher sampling rates in the device. The source code doesnot seem to have code for Arduino ( I think its for avrdude). Can you please post the code using Arduino. The source code provided is all we have, sorry! There is (and never was) specific code written in Arduino, just C.
Damn it. I just programmed using Arduino IDE. Does it mean that the original program was gone? Yes. You wrote over the original code.